Rules were broken while making these muffins. I’m all about experimenting with savory dishes, but I’m strictly law-abiding when it comes to the sweet stuff. Baking is a science. When you upset the balance of wet vs. dry, of gluten and leavening and fat, you’d better know what you’re doing. I’m no baking expert, so I limit my changes to, say, using pears instead of apples, or playing with spices. My mom is a much better baker than I am. Her banana bread (actually, her mother’s recipe) is perfection. It’s counterintuitive: no spices, no butter, no brown sugar; yet the absence of those ingredients intensifies the banana flavor. I know this because, in my misguided youth, I altered that recipe in every way possible. Not one version was as good as the original, and some were just terrible. So Grandma’s banana bread recipe remains unmolested. Until now. I don’t know what made me try combining a blueberry muffin recipe with the sacred banana bread, but boy, did it work, even though it meant adjusting the levels of flour and milk. –The riper the bananas, the better the muffins. The skins should have some blackening, and the fruit should be tender and soft (n0t liquid). 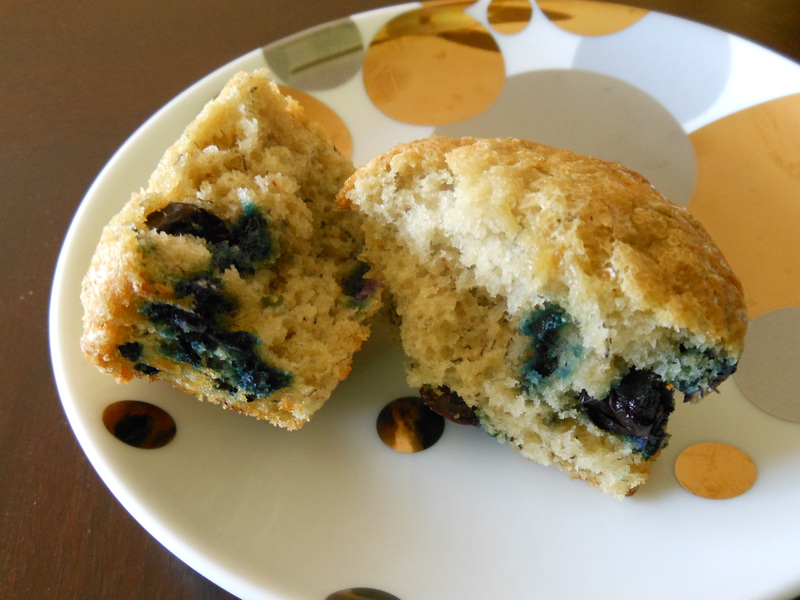 –I’ve only made this recipe with fresh blueberries; if you use frozen ones you may need to reduce the amount of liquid. 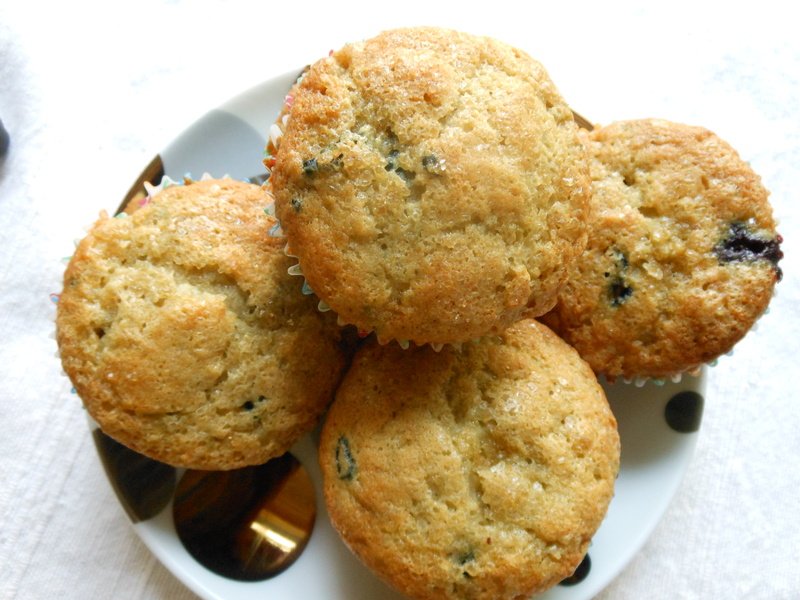 –I sprinkle extra sugar on the tops before the muffins bake, because we love that subtle crunch. Feel free to skip this step if you want to use less sugar. –I believe you can use buttermilk in place of the soured milk, but I haven’t tried it. So for once, I’m asking you not to deviate from this recipe — unless, unlike me, you actually know what you’re doing in the realm of pastry. In that case, have at it, and let me know what you come up with. In a small bowl, stir together the flour, baking powder, baking soda, and salt. Set aside. Pour vinegar into milk (it’s supposed to curdle). In a large bowl, beat shortening and sugar until fluffy. Beat in eggs and vanilla until the batter is thick and the mixer leaves ribbony patterns, about 3 minutes. Stir half the flour mixture into the batter just until barely blended. Stir in the bananas and soured milk, then the rest of the dry ingredients with just a few strokes. Stir in the blueberries just until blended. Spoon into the prepared pans and sprinkle the tops with extra sugar if you want it. Bake muffins for about 20 minutes, loaves for 35-40 minutes, until a toothpick inserted in the center comes out with a few moist crumbs, but no gooey batter. This entry was posted in baked goods and tagged bananas, blueberries, breakfast, muffins. Bookmark the permalink.